Some REVIEWS and remarks made about the bouquets. "The photos do not show how spectacular and beautiful they really are in real life. My bouquet is now in a vase on the table and every time I look at it I fall more in love with it and I am reminded of my special day" Our correspondence was caring and friendly. Thank you, thank you. Xxxxx00000. My wedding was yesterday but I have to tell you how much I loved my brooch bouquet. It is magnificent and everybody was amazed and couldn't stop talking about it. When I found you on the internet I just knew by the quality and imagination of your work that you would make me a special bouquet. Well it is beyond words - I cannot say how I love it. The extra little thoughts and ideas just make it and the jewellery is especially stunning. I want to say a big big thankyou from me and all of my family and friends who admired it. Take care and the very best wishes to you - Brenda - Sussex - United Kingdom. 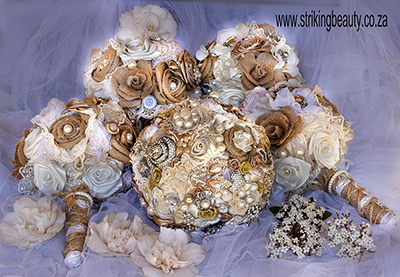 "The workmanship and attention to detail makes the bouquets extra special. They could not have been more perfect"
"I could not wait to receive my bouquet." "Thank you Susan, my bouquet is made with love and is nothing short of gorgeous." "Opening my box and tissue paper and seeing my bouquet for the first time was so exciting - I love it and I was taken aback at how stunning it is." "Thank you for working so hard on this project - there are no words to express my extreme gratitude for what you have done"
"My bouquets were one of the most talked about things at the wedding - everybody loved them and they could not be more perfect. Your artistic talent and love shows in the work that you do" Jeanne – Australia. "Susan you understood my vision and grasped it straight away. I wanted to send you a great big thank you. I loved all the little extra thoughtful pieces and ideas. I had so many compliments all day and nobody had seen anything like it." "You should have seen how it sparkled in the sun and then in the evening lights"
"I have never owned something so beautiful" . Durban. I trust you are well . My wedding was last week and was absolutely amazing. I thought I would send you some pictures- the bouquet was THE talking point of the day- everybody loved it! Huge thanks once again for creating such a special part of my wedding- I will treasure it forever! With fondest love from Brenda – Cape town. You are amazing and you have a special gift! Never stop showing the world your talent, you had a whole audience of people stunned at the work of art you made for me It was perfect. When we opened the bouquet there was not a dry eye in the house. Thank you a million times over! Special greetings and love – Jenny – Johannesburg.